The Kansas Senate has introduced SB 304 which makes it illegal for cities and counties to build broadband networks. It also makes it illegal for them to participate in joint ventures like Google Fiber. This is very important. Without access to municipal facilities and fiber, projects like ours are simply not possible. This bill will effectively kill all municipal networks in Kansas and will cede the entire telecommunications industry to the incumbent phone and cable providers. I wrote an Op-Ed and submitted it to a couple of national news sites today. If no one bites after a few days or a week, I'll publish it here. If someone does bite, I'll link the article so you can see it. I've been giving a lot of thought to how we can build Fiber To The Premises (FTTP) networks both here and in the rest of the country. I've come up with at least one good idea. We'll see if one of their editors agrees. Looking at our monitoring system it looks like we've lost 3 sites so far tonight (out of 800+ sites). Two sites north of peterson drive and one near Meadowbrooke Apts. Dan will chase these down first thing the the morning. EDIT: January 27 - Dan busted his tail today and got every single site back up despite the cold weather. If you appreciate Dan and Lionell and all the hard work they do, tell them that the next time you talk to one of them. The new architecture in central Lawrence is starting to pay off. We doubled the size of our core fiber bus over break and cleaned up our switching equipment to reduce latency and increase bandwidth. We currently have a plan to bring this level of service to our entire community and are looking forward to working with our friends at City hall to make it happen. For those of you who might be interested, here is the presentation we are giving at PIRC today. We've changed our name with ARIN from "Community Wireless Communications, Co." to "Wicked Broadband". As a result, netindex.com has re-started our company history. We've asked them to keep the data from CWC, but it might not be possible. 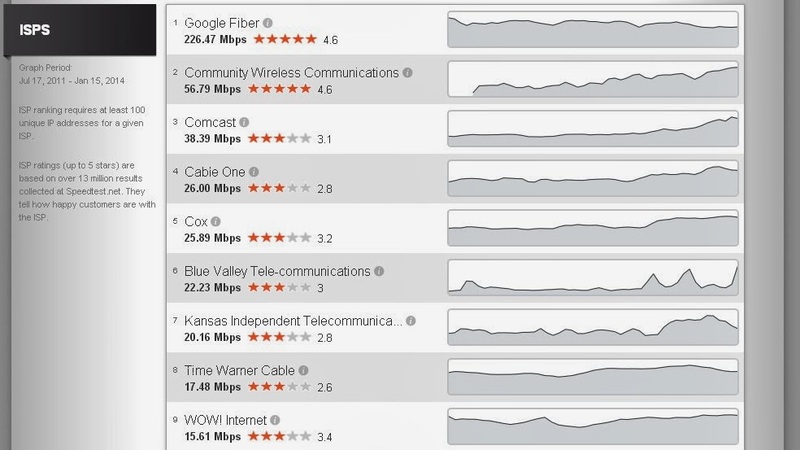 So here is the last comparison of the ISPs in Kansas from the period July 17, 2011 to January 15, 2014. Notice how much our network has improved. Our fiber customers are now seeing real throughput of 300, 400 even 800 Mbps. Quite an improvement from our humble beginnings with a 6 Mbps DSL line and a dream. EDIT: After talking to Ookla it looks like our results won't be added back into the standings for at least a couple days, maybe as much as a month. We recently upgraded our upstream link and changed out the configuration of our network core, so it will be interesting to see where we start out with the new DBA. 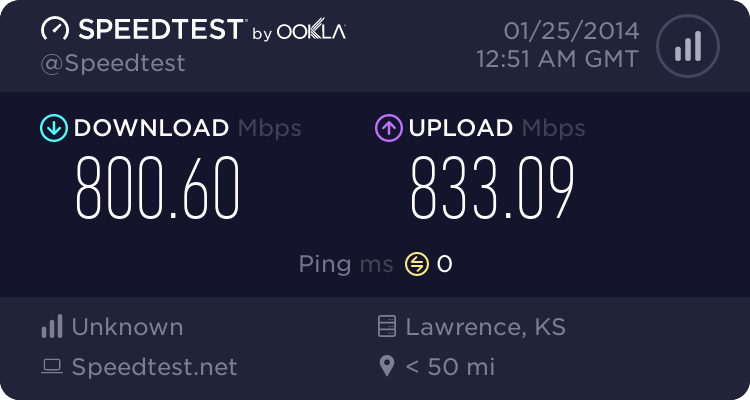 I'd like to be faster than Google Fiber (and in our fiber sites we are), but we still have a lot of legacy sites that are never going to get past 50 Mbps, so we'll likely have to settle for second place (for now). We are going to be doing significant work on our network core over the next week. The goal is to lower latency, increase throughput and simplify our network core. Over the past 5 years or so, our core has grown organically. That means we've installed switching equipment, routers and links according to the immediate needs of our customers and not according to any pre-planned architecture. The result is a setup that is getting increasingly complex and, in some parts, doesn't make sense any longer. It also means we've got odd bandwidth constraints that are not allowing us to make full use of the theoretical capacity of our network. We are going to try and keep down time to a minimum, but if you are using the network during these times, don't be surprised if there are intermittent outages. Every so often we get a request from the State of Kansas to provide information on our coverage area so that they can update their maps for the NTIA. They ask us to respond even if our response is that we are not going to participate. The problem with this survey is that it causes incumbent carriers to overstate their coverage and mis-represents the availability of broadband services. Rural Douglas County, for example, shows that multiple ISPs provide "broadband" service even though there are large sections of the County where there are no Internet Service Providers at all. The reasons for this are threefold. 1. Broadband is defined as 768 Kbps. 2. So called "4G" mobile providers are allowed to represent their products as acceptable for fixed broadband applications. 3. By overstating coverage, incumbents guarantee that no federal or state funds will be made available near their service area. As a result, the survey you are conducting ( and others like it ) have the effect of cementing the arguments of incumbent providers that the US broadband market is healthy, that there is lots of competition and that consumers have a choice of multiple providers. Since our goal as an organization has always been to expand broadband access, your survey works against our goal. For this reason we decline to participate. If you would like to discuss how our state might develop a broadband map that accurately reflects the availability of broadband (defined as capable of streaming at least 1 HD video stream), I would be happy to participate. A vehicle struck our pole at 28th & Harper taking down service to much of the neighborhood. Crews are on site and we hope to have service back up tonight, tomorrow at the latest.